Forest City, Jan. 2—From present indications it is probable that standing room will be at a premium soon after the doors of the handsome new Romina Theatre are opened on Thursday night. The presentation exercises are to begin at half past seven o’clock and will consist of the introduction of C.O. Kuester, of Charlotte, by C.D. Hughes, the manager, in behalf of the owner, Walter H. Haynes, of Cliffside. Mr. Kuester, who is a member of the Queen City Chamber of Commerce, will present the Romina Theatre to Forest City. The Mayor, Charles Z. Flack, is to accept it for the city, and then Clyde A. Erwin, Superintendent of Education, will make an address. A gala performance by a noted musical organization, “Good Fellows Music Makers,” of Charlotte, will follow and the evening’s entertainment will close with the showing of what is described as one of America’s love classics, “Ramona,” a film that features Dolores Del Rio. The music for the moving picture is to be by the new Photophone, an instrument that reproduces from records electrically and gives the effect of an orchestra playing. The members of the “Good Fellows Music Makers” are to be entertained at dinner before the performance, by the Kiwanis Club and it is understood that the club will attend the opening in a body. It is no secret that Walter H. Haynes, of Cliffside, considered building a modern and up-to-date theatre in Forest City for some years but it was not until the spring of 1928 that he decided to do so. After the purchase of the land, on the north side of Main Street, in the middle of the square, the very business heart of the city, Mr. Haynes commissioned R.E. Carpenter of Cliffside, to draw the plans and later selected G.K. Moore to build the structure. It stand on a plot with a frontage of fifty feet and the depth is one hundred feet extending back to an alley. Three stories in height, the facade is of canary cream colored brick trimmed with terra cotta to harmonize in the color scheme. The entrance is in the middle. A handsome marquee, ten by nineteen feet extends across the pavement to the curbstone, giving a pleasing yet dignified appearance. It is supported by two long chains of iron attached to the wall, and it affords protection to the patrons entering or leaving the theatre. Around the three sides of the marquee is ample space for advertising, both by means of white letters and electric light bulbs. Two stores, each eighteen by eighteen feet, flank the entrance and at the extreme right, as one faces the theatre, is the stairway leading to the three offices on the second floor. One of these is to be occupied by the manager, C.D. Hughes; the other two have been rented to Dr. R.R. Howes. The corridor is wide and at each end there is a lavatory. The ticket booth stands at the entrance of the theatre lobby; it is up-to-date and patrons can be accommodated quickly and easily. Entering the lobby, which is tiled and measures fourteen by eighteen feet, the general color scheme inside is seen. It is of harmonious browns with panels lightly decorated in pale greens. On each side are stairways to the large balcony; at the left is a well-fitted retiring room for women, and another, on the right, for men. At the rear of the seats is a wall, possibly four feet in height, and surmounting it is a rail. Hung from it are attractive curtains. The aisles, as well as both stairways, are carpeted. The seats are upholstered and covered with leather; they are comfortable and well arranged, the slope being sufficient to afford an excellent view of the stage from all parts of the theatre. To the right and left of the stage are exits leading to the alley at the rear. These are marked with red lights. The stage itself measures twenty-eight feet by fourteen; the proscenium arch is graceful and on either side, about half way up are two grilles. These can be used for organ pipes if it should be decided to build one at any future time. The ceiling is slightly domed in effect and the lights are covered with handsome fittings. Mechanically, the stage leaves nothing to be desired. It is fully equipped for vaudeville and the scenes can be shifted quickly. There is room for many [back]drops and the arrangements for lifting and lowering them are thoroughly modern. The orchestra pit is in the front of the stage and is of sufficient size to accommodate a good many pieces. A doorway leads to underneath the stage. There are five good sized dressing rooms with all the conveniences, and from them there are two stairways, one on the right and the other on the left. All the lights are controlled from a single switchboard at the right of the stage; it is modern and the lights can be dimmed at will. In addition, there is a strong spotlight which is operated from the projection room at the back of the balcony. The large balcony is well planned; the seats are arranged in tiers and are very comfortable, from every part of the second floor there is an unimpeded view of the stage. In the steps, in the aisles, there are small electric lights, so as to make it easy to find one’s seat. In the center, at the rear, is the projection room. It houses two of the largest Simplex machines, an automatic rewinder and in fact everything that the very latest and best projection rooms contain. The ventilation fans, by which a fresh supply of air is assured at all times, are controlled by a switch in this room, as is always the spotlight. Of course any color, or combination of colors can be thrown on the stage. The entire building is as fireproof as it could be made; not only were the statutes of North Carolina followed to the letter, but those far more rigid of New York, were met in the construction of this beautiful structure. There is a small room to the right of the projection room which contains the Photophone. It is an instrument not unlike a very large phonograph in general appearance, but that ends the resemblance. It is operated electrically and the operator can change the records at will, switching from one to the other if he wishes to do so by manipulating a small lever. The volume of sound can be increased or diminished at will and so perfect is the reproduction of an orchestra that all that is necessary is to closes ones eyes and listen; opening the eyes one looks around for the musicians. The Romina Theatre will seat about 750 people and the cost of the building, furnishings, etc., was $125,000. The plastering, very well done, is the work of C.G. Sumerlin of Rutherfordton; all the steel contained in the structure was furnished by the Southern Engineering Co. of Charlotte; the roofing and sheet metal work was supplied by G.G. Rayand Co. of Charlotte; Charles W. Christian of Charlotte was the heating engineer; Parker-Gardner Co., also of Charlotte, furnished the curtains and draperies. Many other firms were called upon to supply this or that necessary for the building and furnishing of the theatre. C.D. Hughes is the manager; Mr. M.H. Mauney, of Forest City, is the assistant manager, and Edgar Shaw of North Wilkesboro, will operate the picture machine, and Bo Norris, a son-in-law of T.R. Padgett, will have charge of the Photophone. It will be the policy of the Romina Theatre to show only the latest and best moving pictures. Mr. Haynes chose the name “Romina,” coining it from the names of his two daughters, Misses Amanda and Rosa Mae Haynes. It is a name that well fits the theatre which is indeed a credit to the entire county as well as to Forest City. It is understood that the demand for tickets for the opening night has been very large; certainly the program is an excellent one for the “Good Fellows Music Makers” are worthy of their title. They will present a number of solos, duets and ensemble numbers. The photo drama “Ramona,” is a good one and the attractions for the following week or ten days are all excellent. This item was printed in The Sun on January 3, 1929. Horn’s was a popular theater in Forest city, established well before the Romina. From 1926 through 1928, we found not a single advertisement for Horn’s in The Sun. But, beginning on the day this Romina article and ad appeared, and throughout 1929 (at least), both theaters ran frequent ads listing their weekly lineups. Ah, the power of competition. 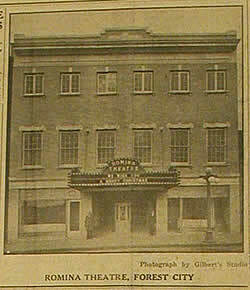 Other theaters that advertised infrequently in the county paper were the Royal and Liberty in Spindale, and the Princess in Shelby. Contributor Jim Scancarelli, a collector, tells us he has owned and listened to a number of PhotoPhone disks. One or more of these disks would be sent to the theater along with the film reels. A disk contained music—and dialogue—that, during a performance, would be synchronized with the film. Alas, the PhotoPhone technology was soon outmoded; within months the film industry standardized on an optical sound system, where a stripe of sound was printed right on the edge of the film itself, requiring the Romina, in fact all theaters, to convert their projectors or buy new ones.